I’m a doctor from the UK. Here’s how it works: I have patients in hospital. They are sick. It’s my job to make sure they survive and then to try to make them better. However, I don’t have the tools that could help make my job easier. Considering I can talk to my smartphone and tell it to send a message to my dad or remind me to water the plants when I get home – why is it so difficult for me to get access to vital information about the people I look after? Here’s an example: at the beginning of my shift, my patients are handed over to me by the team who have looked after them for the last 12 hours. Logical, yet this process is surprisingly painful. At the moment, I have to write things on a scrap of paper and carry that paper around. Each time I find out something new about one of my patients, I jot it down. When I then hand those patients over at the end of my day to another doctor, they write on – wait for it – a new piece of paper. Some people use the ‘Notes’ application on their phone to jot this stuff down. Slight problem with that – you’re not supposed to put patient-identifiable data on your personal phone. It’s not very secure, is it? But then again, neither is carrying a crumpled scrap of paper with the same crucial information. It’s a daily occurrence that people accidentally leave that paper somewhere, which is easily done – you need two hands to take blood from someone or listen to their chest. The next thing you know, that scrap of paper is gone. I recently talked to a senior doctor who proudly declared that their department had implemented electronic ‘handover’. He told me it was something that the hospital’s IT department had built in-house. Apparently it’s working really well and people are happy with it. Wow! This I had to see. I went there, and as a hacker, “wow” was my exact reaction. Can you guess what it was? Yep – a Word document. A Word document installed on 4 hospital computers with a list of all the patients on the ward and some crucial information about their care. It would be nice if I didn’t have to call the person on the other side of the ward to close her window, so that I can edit my patient’s information on my computer – but perhaps that is too much to ask. With the current system, it is difficult to find out who wrote that this patient’s lungs sounded a bit wheezy, or that their family wants to discuss something. Having something which means people are accountable for what they write is crucial. This process is so emblematic of how patient data is shared in healthcare. This is why I quit a great job – the one I spent years training to do. People need to find out about how broken things are in healthcare, and as one of the few doctors who can code, I believe I can help fix this. This is 2012. It’s high time that looking after patients was made a little bit easier. After saying goodbye to my life as a doctor, I’ve built a simple, web-based prototype – which plenty of doctors are eager to use. At the moment I’m in Silicon Valley to try and take things to the next level. If you’re a talented hacker, who thinks health is important or wants to build something that solves a real problem – get in touch. This post was contributed by medic and technologist Gautam Sivakumar. 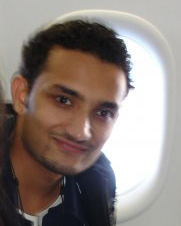 Gautam qualified as a doctor in the UK, at the University of Newcastle. He has recently moved out to Silicon Valley, where he is building his medical technology company, Medisas. You can read the original post and comments here. Gautam recently joined the Doctorpreneurs LinkedIn Group, along with over 100 other new members. If you’re not yet a member you can join here.